[Editor's Note: I've repeated this explanation many times in reviewing the Illuminati's game plan to destroy America, but it's worth saying it again: The reason that Marine Corp, Army, and Naval Special forces are trained to slaughter the "enemy" like mad dog killers without any respect for humanity or innocent civilian life, is because the NWO traitors in the U.S. government WANT the world to breed a seething hatred towards the U.S. military The abuses at Abu Ghraib prison or Guantanamo, for that matter, are first intentionally instigated and then allowed to "leak" to the press. This doesn't excuse anyone in the U.S. military who allows himself to be used like a Nazi and murders innocent people because he's been given a green light, but it does explain that the 'kill-em-all' policy, if you can call it that, comes from the top: from the White House down to Tommy Franks or General Petraeus, to the local command structure, and down to the platoon leader. The Nazi policy is intentional. The goal is to destroy America's hard won reputation from World War I, World War II, and the Korean War of being the world's "good guys", defending freedom and all that. People who are in the military and their families need to wake up to this reality and re-assess their roles as cogs in this Killing Machine . ..Ken Adachi].
" The rules [of engagement]t explicitly allowed the killing of unarmed Iraqis under certain circumstances...Specifically, the snipers were allowed to shoot unarmed people running away from explosions or firefights....Of course, it's not unusual for innocent people to run from explosions. Didier, who has since been promoted to captain, said that "if that individual makes contact with you and then breaks contact of their own accord and disarms themselves while they are breaking contact, they are still an engageable target because they are not wounded, nor did they surrender." He explained, "They are only breaking contact so that they can engage coalition forces at a later time." In court, Sgt. Anthony Murphy, one of the snipers who was responsible for a questionable kill, testified that he interpreted this order about breaking contact so they can engage at a later time as: "Engage fleeing local nationals without weapons." In other words, if an innocent, unarmed Iraqi runs away to seek safety from a suicide bombing, a missile attack or a gunfight -- which any human being would instinctively do -- then he is fair game to be killed by an American sniper. The excerpt above comes from a story in Salon.com, "Killing by the Numbers," about an "elite" U.S. sniper squad that murdered a captured, unarmed civilian in cold blood. A more detailed excerpt follows below, but I'd like to deal briefly with one ancillary aspect first. The story expands to talk more generally about the sniper program in Iraq, and is careful -- overly careful -- to emphasize that the snipers responsible for so many "questionable kills" are operating in very stressful conditions: sleep-deprived, sweltering in deadly heat, surrounded by potential "hostiles," at constant risk of attack. All true, of course, but it prompts this simple question: What the hell are they doing there in the first place? Why are they squatting and sweltering in "hides" in a foreign land, looking to kill people who never attacked the United States? Yes, it is entirely understandable that a soldier subjected to nerve-wracking, physically tormenting conditions might fail to act with reason, patience, judgment and prudence. But is this supposed to be some kind of excuse for crimes committed within the context of a larger crime: a war of aggression, the military invasion and occupation of a foreign country without any provocation? Surely many of the Nazi atrocities were committed by men under unbearable mental and physical strain as well. So what? Were they absolved of their crimes? And more importantly -- were their leaders absolved for instigating the larger crime that engendered these atrocities? For as the story also shows, the "questionable kills" by American snipers derive largely from the murderous "rules of engagement" they are given by their superiors -- and by the anxiety of their officers to produce big "kill numbers" to appease the bloodlust -- and PR needs -- of the thugs in the White House and their "counterinsurgency genius," David Petraeus. But let's return to the story of how a sniper squad murdered Genei Nesir Khudair al-Janabi, an Iraqi vegetable farmer, almost one year ago, after he stumbled upon their "hide" on the banks of the Euphrates. Sandoval, who had been woken by the sound of the Iraqi's approach, motioned toward Vela's gun. Taking the signal, Vela pointed the 9 mm pistol at the farmer's face. Sandoval woke up Redfern. Redfern and Vela waved the Iraqi into the hide, forced him down on his stomach and put the corner of the plastic poncho over his head. Vela stood over the man with the pistol, while Redfern ran his hands over Khudair's shoulders, arms, sides, back and chest in a cursory search. No weapons. Vela woke Hensley and told him an unarmed Iraqi was in the hide. Hensley stood up, walked over to the Iraqi -- and from a standing position dropped a knee into his back with the full force of his body. Khudair threw his head back, gasping for wind. "Staff Sgt. Hensley grabbed him by the mouth," Vela testified, "and told him to shut up or he was going to kill him." Sandoval peered around the pump house wall to look into the hide. Khudair was still there. Vela was sitting on his rear, with one leg cocked up and an elbow resting on his knee, holding the pistol in one hand. Inside the hide, Hensley radioed Didier a second time, saying an insurgent was moving closer to their position. Hensley asked permission to do a "close kill" to avoid being compromised. Vela then looked around, but still didn't see any armed insurgent. "I was just really confused about what he was saying," Vela testified. Hensley untied the Iraqi. "I thought we were going to let him go," Vela told the Army court. "Are you ready?" Hensley allegedly asked Vela. Hensley stepped aside. "Shoot," he said. Vela claimed during testimony that he doesn't remember pulling the trigger. "It took me a second to realize that the shot had come from the pistol and it was in my hand." Hensley radioed to Didier that the snipers had killed an insurgent. Meanwhile, the Iraqi's body convulsed. Hensley "kind of laughed" at the spectacle, according to Vela. Hensley then "[punched] the guy in the throat, and said, 'Shoot him again,' which I did." Sandoval was charged with murder for the deaths on April 27 and May 11, but convicted only of planting command wire in connection with the April 27 killing. He served about a month and a half in prison. The Army charged Hensley with three murders for the shootings of April 14, April 27 and May 11. He was convicted of planting a weapon, for placing the AK-47 next to Khudair, and insubordination. He was sentenced to time served and busted down to sergeant. On February 10, 2008, however, Vela was sentenced to 10 years in a military prison for the murder of Khudair. It goes without saying that the officers who put these men in this situation -- not to mention the civilian "leaders" in Washington who instigated the mass murder in Iraq -- suffered not the slightest adverse consequence of this crime, for which they bear the primary responsibility. A Marine from Camp Pendleton who was sentenced to 15 years in the brig for killing an Iraqi civilian had his term reduced by four years, the man's attorney said Wednesday. Rich Brannon, the civilian lawyer for Lawrence G. Hutchins III, said the reduction came after he appealed for clemency to Lt. Gen. Samuel T. Helland, Hutchins' commanding general. "I was pleased to see a reduction, but I would like to see more," Brannon told The Associated Press in a phone call from North Carolina. Hutchins, of Plymouth, Mass., was the leader of an eight-man squad accused of kidnapping Hashim Ibrahim Awad, 52, from his home in April 2006, then marching him to a ditch and shooting him to death. 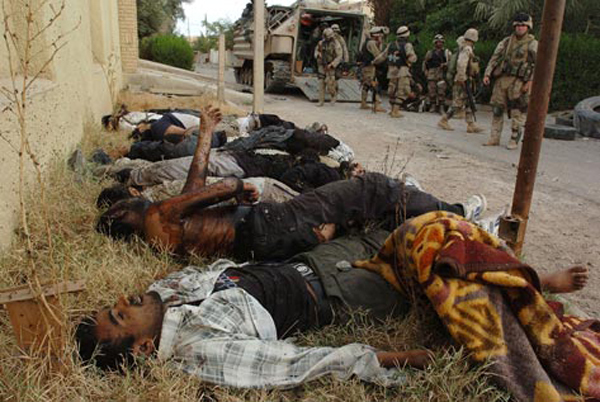 The killing took place in Hamdania, a small village in Al Anbar province. Hutchins was sentenced Aug. 3 after being convicted of murder, conspiracy to commit murder, making a false official statement and larceny. He had been charged with premeditated murder, but premeditation was removed from the verdict, meaning Hutchins no longer faced a mandatory life sentence. All eight squad members — seven Marines and one Navy corpsmen — were initially charged with murder and kidnapping, but four lower-ranking Marines and the sailor cut deals with prosecutors in exchange for their testimony and received sentences ranging from one to eight years in prison. Other Marines were acquitted of murder but convicted of lesser charges and freed after their courts-martial. When even the scapegoats escape justice, what possible hope can there be that the perpetrators and abettors of the Nazi-like war crime in Iraq will ever pay the price -- or even suffer the slightest trouble -- for their monstrous outrage? The views expressed in this article are the sole responsibility of the author and do not necessarily reflect those of Uruknet . The Americans in Congress and the Senate that allow this to continue are all subject to war crimes as far as I am concerned. It is absolutely insane to think this has anything to do with freedom or anything to do with humanity. As for stamping out Terrorists, this is not accomplishing that. It is making 10 fold the terrorists ranks for everyone they kill. And as sure as I am a Canadian, this will come back to haunt America in a very very bad way. There are over a B for Billion Arabs they all see this as injustice against the muslims. gets bombed out.Well this will not derail the neocons, as the economic situation in America has already made many cities look like they were bombed out . Cities like Boston, Cleveland,etc.. not to mention all the rural areas are looking like German cities circa 1946. So desperate are the Americans for Iraq's oil to pay their masters their dues that they don't care what it takes to get that oil and maintain that oil. No they wont tell you this nor will the western media write this . but the facts are clear for all to see. just as in all the previous major wars.all preceded by economic downturns. So s erious is the American downturn this time I expect we will see Iran,Syria,Pakist an embroiled in this war sooner or later. Perhaps India Russia and china as well. The writing is on the wall. While many if not most Oil producing states are refusing dollars or planning on refusing dollars in the near future, China is now refusing US dollars for goods in some cases .Especially at Walmart, the big buyer of Chinese goods. America has a free money machine it prints and has printed so much money that if all that US money came back to the US, the dollar would be worth no more than 1 square of Toilet paper made in China. Any logical person knows these truths. They know that sooner or later all hell is going to break loose. Americans are too vain and self centered to allow their mistakes to break their economy. They would prefer to fire every nuclear missile off instead of losing their hegemony. My warning is that it is nearing the breaking point now. American banks are closing ,economically, cities are looking bombed out, middle class Americans moving to tent cities, jobs are being lost at record pace, prices of food and gas are rising exponentially . The culmination is at hand ,things will begin to move faster now. I hope people have been paying attention and understanding the signs.Many many will perish not only in Iraq but in America too.